I have an ADATA Classic CH94 back up drive I've had since 2012, along with my MacBook Pro. However after a minor Apple update I did through the App Store (I'm currently still on macOS High Sierra) I wasn't able to see my back up drive on my desktop when I plug it in. I went into Disk Utility and saw it there, but the volume partition is greyed out and 'not mounted' appears. But, when I click on Mount, nothing happens. I had this problem last year. However, Mount wasn't an option and Apple Support told me to erase the disk and I lost everything, although that didn't matter. What I have on it now would be useful to keep though. Is my data safe on the drive? How can I fix this? 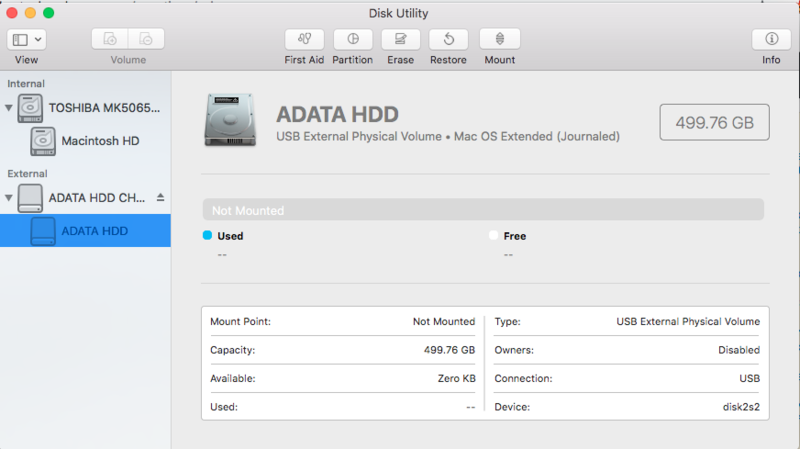 Running First Aid from inside Disk Utility might be the way to go. If it successfully repairs the volume it will mount it straight away. If it can't successfully repair the volume, it will attempt to mount it in a ready only form, and if it can you'll be able to copy things back off it before reformatting. Depending how important your data on there is, you may want to look into software for data recovery first, or use the dd command to make a bit-for-bit copy of the whole disk so that if you can't get the disk to mount again, you have a copy of it's state, and you can run data recovery software over that to try put your files back together and recover them. dd will make a disk image the size of the whole disk though, so you will need somewhere with at least 500gb of space to store that. if= is input file, which in this case is disk2 (based on your screenshot above). I use rdisk instead of just disk as it usually runs a bit faster (I looked into why a while back but can't remember now, but did test it out when I had an explanation and found it usually was about 40% faster at the time). of= is the output file, which I've given the example of being on an external disk. (I'm assuming since this 500gb disk was your time machine backup, that your internal disk is also 500gb or less). The output disk image will always be a .img file, if you specify for example .dmg, you when up with diskimage.dmg.img. .img is pretty standard so you shouldn't have much trouble with software reading it. conv=noerror means if it received an I/O Error while reading the disk, it will continue trying to read the rest, instead of quoting halfway through. If you are getting a bunch of these, it may be worth trying a new USB cable, but if you still get them, the Hard Drive is failing. If this is the second time the drive has become unmountable, then it does sound like something hardware might be going on, so if your USB cable if looking funky, you might need a new one, or the hard drive might be finally giving up. Not the answer you're looking for? Browse other questions tagged macos hard-drive external-disk mount . Failed High Sierra update, can't mount drives, how to recover files?